Two teams of 6 players each (with substitutes) play the sport of volleyball, on a court that is divided by a net. The object of the sport is to hit an inflated ball (the volleyball) over the net, such that the opposing team cannot return the ball either because the ball has been “grounded” (i.e. the volleyball has touched the court surface within the defined boundaries of the opposing team’s court), or the ball is returned back over the net but lands outside of the defined boundaries of the opponent’s court. Each team has a maximum of 3 hits to get the ball over the net to the opponent’s side of the court within the boundaries. The play begins with one team serving the ball over the net to the other team, which in turn has the three hits allowed to get the ball back over the net to the serving team’s side. Each team continues to attempt to ground the ball (or make it otherwise non-returnable) in the opposing team’s court. This process is called a “rally” – once a team wins a rally, they are awarded a point. If the serving team wins the rally, it maintains the serve. If the team receiving the serve wins the rally, they are awarded the point, gain the right to serve, and the team’s players rotate one position to the left (or clockwise). The above was a very general description of Volleyball Rules & Regulations, and should be enough to help you get started. However, keep reading to get into the specific rules of the game so that you may have a more thorough understanding of this fantastic team sport. There are a set of common rules no matter what age and competition level at which you play, but in some instances there are slight differences in rules between middle and high school, university, and national / international levels of play. In the vast majority of cases, indoor volleyball is played in a multi-purpose gymnasium either at a school or university, and the court lines are superimposed on the floor along with basketball, badminton, handball, and so forth. In national and world-level competition, the court surface is usually dedicated only to the sport of volleyball. The free zone is the area surrounding the court itself, in which the ball can be played. It varies slightly for school age, university, and international FIVB. The main goal of the free zone is to provide a safe area for players to play the ball – stands for spectators, equipment and so forth should not be in this area except for the volleyball net stands, the referee stand, etc. High school and University: at least 2 meters, 3 meters is preferable. National / FIVB: minimum 3 meters, with a minimum of 5 m from the side lines and 6.5 m from the end lines for world and official tournaments. The official heights for the nets vary for men and women, but of course you want to have success early on for beginner players so by all means feel free to adjust the net height. In general, teams must have at least 6 players to start the match, and at least 6 eligible players (substitution players, or “subs”) to play the match. There are 6 players on court for each team during the match. In FIVB rules, a team may have up to 14 players in total. The server must toss (i.e. release the ball), and then must contact the ball behind the end line in the service area located behind Zone 1 (usually a 3 meter wide area). Neither foot may touch the line during the contact. In the case of a jump serve, the jump takeoff must be behind the line as well. The players on the serving team must not arrange themselves on the court in such a way as to block the view of the server or the ball, nor wave their hands or make other distracting movements. There are some minor volleyball rule differences regarding the toss before the serve. In FIVB, university and high school matches, the server must hit the ball within 8 seconds after the referee whistles for service, and only one toss is allowed. For players under age 14 (i.e. middle school), the time is 5 seconds from the whistle, but the server may have a second toss if the first one was not effective, and lands without touching the server. Each team has 6 players on the court at any one time. At the start of the game, or “set”, each team’s coach arranges his / her players in the zones of the court. This arrangement dictates the rotational order of the team when they are awarded the serve (either at the beginning of a set, or after a “side-out” in which the team who served the ball to start a rally loses the point). It is critical to note that when a team is serving, the players of each team must be in their zones. After the service hit, the players may move around and occupy any position on their court and the free zone. If the serving team wins the rally and maintains the serve, the players on each team MUST go back to their original zones for the service (then are able to move again). This order must be maintained throughout the set. If there is a side-out, and the opposing team is awarded the serve, that team rotates one position clockwise as shown in the above diagram (i.e. the zone 2 player moves to zone 1 and serves, the zone 1 player moves to zone 6, the zone 6 moves to zone 5, and so on). It is important to note that while the zones have a definite area, there is flexibility within the areas regarding players locating themselves within their specific zone – to a certain extent. Each back-row player must be positioned further back from the centerline than the corresponding front-row player. The front-row players and the back-row players, respectively, must be positioned laterally in the order indicated in the diagram. Each front-row player must have at least a part of his/her foot closer to the center line than the feet of the corresponding back-row player. Each right or left side player must have at least a part of his/her foot closer to the right or left side line than the feet of the center player in that row. That team successfully grounds the ball on the opponent’s court, within the defined space including when any part of the ball touches any of the side or end lines (in other words, the lines are considered “in”). When the opponent team commits a fault (i.e. an action going against the rules). When the opponent team receives a penalty. If the serving team wins a rally, it scores a point and continues to serve. If the team receiving the serve wins a rally as defined within the above three sub-points, that team scores a point and it gets to serve next (also called a “side-out”). A “set” is a single game of volleyball, and a “match” is a certain number of sets played to determine the overall winner of the play between two teams. A set is played to 25 points, with points being awarded from each rally (also called a rally-point system). Teams must win by two points to win the set; in the case of a tie at 24 points each, for example, a team would have to win 26-24. A match is a maximum of 5 sets, with a team being declared winner of the match if it wins 3 sets (i.e. a team may win 3-0, 3-1, or 3-2). In the case of a 5th set when the match is tied at 2 sets each, the final set is played to 15 points rather than 25, with the win by 2 points rule remaining in effect. According to volleyball rules, high school and middle school teams will often play in a three-team round robin format, especially if there are many teams in a league and court / gym venues are limited in the area. In this case, two teams play while the third team watches (or perhaps is in another area practicing). There is some leeway in the rules to play such that a match of 3 sets may be played, with all sets to 25 points. In a university round robin format as described above, the choices are best 3 of 5 sets, or best 2 of 3 sets (with the sets going to 25 points, win by 2 point rule in effect). In FIVB, it is best 3 of 5 sets. Violations of the rules for a player or players on one team results in a “fault”, with the rally ending and a point being awarded to the opposing team (and the loss of serve if applicable). Teams may only hit the ball three times when the ball is on their side of the court. The third hit must get the ball over the net, into the opposing team’s court area. If two or three players on the same team hit the ball at the same time, it counts as two or three hits, with the exception of two or three players blocking the ball. Playing the ball after a block (i.e. the player contacts the ball in a block, then digs out the ball from hitting on his/her side of the court). Playing the ball on the first hit of a team (in which case the ball may contact various parts of the body in succession, but must be in the same motion). Players may not receive assistance from another player, or an object such as the net stand, in order to hit the ball. 3. The ball must be hit cleanly – in other words, the ball cannot be cradled, carried, caught, thrown, or directed. The ball must rebound clearly off the player. 4. During the serve, the server’s foot may not touch the end line during contact with the ball. The server’s teammates may not block the opponent’s view of the server, the ball, the trajectory of the ball, and so on, nor can they distract the opposing team. 5. The ball may be played within the court area, the free zone, and beyond the free zone. It the latter instance, this area is called a “non-playing area” and must be able to be safely navigated. Middle and high school players, and university players must be touching the playable surface to legally play a ball over a non-playable area. For FIVB players, the ball may be retrieved from beyond the free zone when the surface change is lower by ½” or less, and the area is free of obstructions. If this condition does NOT exist, then a player must be touching the playable surface to play a ball over a non-playing area. This accounts for specific volleyball venues that may have a raised playing surface. The ball must cross over the net within what is called the “crossing space”, which is the air space over the top of the net between the sidelines. 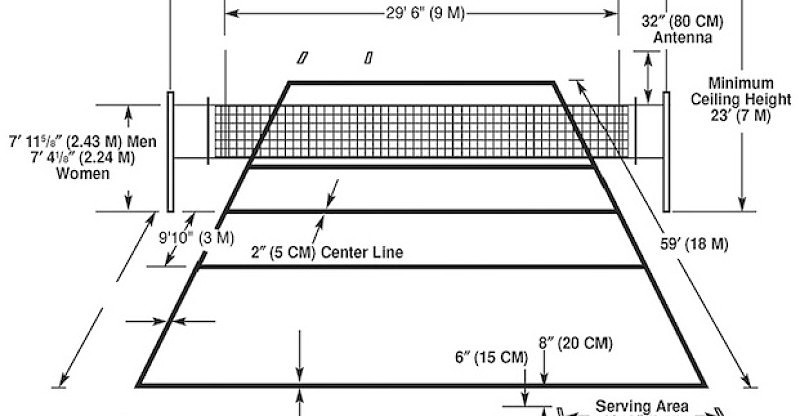 In official matches and tournaments, there are antennae on the top of the net directly above the sidelines to assist with defining this space (see court diagram in Section 1). Otherwise, the ball is “out”. The ball may touch the net as it goes over, and may be played off the net as well. However, it may not touch the wires, antennae, stand or padding. Players may not contact the net (the exception being if the ball is driven into the net by one team, causing the net to touch a player on the other team). Middle and high school players cannot contact the net, net cables, or net antennae except contact by loose hair. Contacting the net or net cables is also a net fault. Dangerous contact with or gaining an advantage from the standards or referee platform is a net fault. If university and FIVB players contact the net between the antennae, during the action of playing the ball, it is a fault. The action of playing the ball includes (among others) the take off, the hit / attempted hit, and landing. However, players may touch the post, ropes, or any other object outside the antennae, including the net itself, provided that it does not interfere with play. 4. A player may not touch the ball or an opponent in the opponent’s space, before or during the opponent’s attack hit. 5. A player’s foot or feet cannot penetrate completely into the opponent’s court. Middle and high school players can touch opponent’s court with feet or hands, provided some part of the extremity is on or above the center line. Contacting the floor across the centerline with any other part of the body is a fault. University and FIVB players can touch opponent’s court with feet or hands, provided some part of extremity is on or above the centerline. Players may also touch the opponent’s court with an entire foot or hand or any other body part(s), provided the encroachment does not present a safety hazard, does not interfere with the opponents, and some body part is on/over the center line. 6. In blocking, a player may not touch the ball beyond the net and interfere with the opponent’s play before or during the opponent’s attack hit. While all players can play the ball, there are certain restrictions on which players can “attack” the ball, and from where they are in the court, during a rally. The attack hit is defined as any hit of the ball with the intent of it going over the net to the opponent’s court. From a “zones” perspective, a front-row player (i.e. those players who at the time of the serve were in zones 2, 3, and 4) may complete an attack hit at any height of the ball, provided that the contact with the ball has been made within the player’s own playing space. A back-row player (i.e. those players who at the time of the serve were in zones 1, 6, and 5) may complete an attack hit at any height only from behind the front zone, as marked by the “attack” line or 3-meter line. A back-row player may complete an attack hit from the front zone, if at the moment of the contact a part of the ball is lower than the top of the net. 2. A back row player may not, at his/her takeoff, touch or have crossed over the attack line (but after his/her hit, the player may land within the front zone). 3. A back-row player may not complete an attack hit from the front zone, if at the moment of the hit the ball is entirely higher than the top of the net. 4. The serve cannot be attacked. Middle and high school players cannot attack the opponent’s serve from in front of, or behind, the attack line if the ball is entirely above the top of the net, according to volleyball rules. University and FIVB players cannot attack the opponent’s service, when the ball is in the front zone and entirely higher than the top of the net. 5. A player may not hit the ball within the playing space of the opposing team. Back-row players may not block. Players may not touch the ball in the opponent’s space, either before or simultaneously with the opponent’s attack hit. Players may not block the ball in the opponent’s space from outside the antenna. The serve may not be blocked. It is important to remember that while volleyball is a very free flowing sport during rallies, with players moving all around (subject to some restrictions on who can play the ball from where on the court as described above), the rotation and position rules are very strict. As such, faults are declared if the rules from section 4, PLAYER SERVICE ROTATION AND POSITIONING RULES, are not followed. A point and service is awarded to the opponent (and the order of the offending team must be corrected). The scorer determines the exact moment when the fault was committed, and all points scored subsequently by the team at fault must be cancelled while the opponent’s points remain valid. A point and service awarded to the opponent. The player positions must be corrected. Players in the starting rotation may be substituted with other players from the team, with certain restrictions. A player that has been substituted may re-enter the game, but only in the position from which they were substituted. Coaches must request a substitution with the referee. In cases where there is a substitution zone on the playing surface, a player entering the substitution zone also represent a request. Inserting a Librero does not count as a substitution. Middle and High School – 18 substitutions per set. University – 12 substitutions per set. FIVB – 6 substitutions per set. A player of the starting line-up may leave the game, but only once in a set, and re-enter, but only once in a set. 5. An “exceptional substitution” may occur when a player (except the Libero) cannot continue playing due to injury or illness. They should be substituted legally, but if this is not possible, the team is entitled to make an exceptional substitution. This means that any player who is not on the court at the time of the injury/illness, except the Libero, second Libero or their regular replacement player, may be substituted into the game for the injured/ill player. The substituted injured/ill player is not allowed to re-enter the match. The offending team is penalized with a point and service to the opponent, and the substitution must be rectified. The points scored by the team at fault since the fault was committed are cancelled, while the opponent’s points remain valid. You may recall that the Librero position is a designated defensive specialist on the team. There is one Librero designated per set, per team, in middle school, high school and university levels while the FIVB allows up to 2 Libreros designated per set (with only one Librero allowed on the court at any one time). A Librero’s uniform must be a significantly contrasting colour to that of his / her teammates (while being of the same style, having the same logo, and so forth). The Librero is restricted to perform as a back-row player, and is not allowed to complete an attack from anywhere on or off the court if, at the moment of contact, the ball is entirely above the height of the net. The Librero may not block, or attempt to block. The Librero may serve in one rotation per set. A teammate may not complete an attack when, at the moment of the attack, the ball is entirely above the net and the ball is coming from an overhand finger pass by a Librero on or in front of the attack line. The ball may be freely attacked if the Librero overhand finger passes from behind the attack line. If he / she is airborne, the Librero’s position is judged according to the point of last contact with his/her team’s court. The Librero replacements are not counted as substitutions. They are unlimited, but there must be a completed rally between two Librero replacements (unless a penalty causes the team to rotate and the Librero to move to position four, or the Acting Librero becomes unable to play, making the rally incomplete). The Librero is allowed to replace any player in a back-row position. The player who is replaced by the Librero can only replace the Librero. An incorrect Librero replacement is penalized with a delay of game if the officials identify and correct the situation prior to the next service contact. If identified after service contact, a position fault results and the opposing team is awarded a point, and the serve. Replacements can only take place after the end of a rally, or at the start of each game after the referee has verified the starting line-up. The replacement must occur while the ball is out of play and before the referee signals for serve. A replacement will not be allowed after the referee signals for serve. A Librero, and the player replaced by the Librero, must enter or leave the court only by the sideline in front of their team bench between the attack line and the end line. While there are many other very specific rules to the sport of volleyball (such as location of team benches, coaching positions on the court, length and number of timeouts, and score sheets just to name a few), the above descriptions of the overall rules should be more than enough to get you started!